We had a LAN at the Rymer’s this weekend, which was a new experience for me. This game we decided to play roles that we weren’t very familiar with. In this case we had Goldboat on support which never happens, Iggie playing top lane which is also very rare, Choppes running the AD carry role, and myself in the jungle. If I had to count all the times I had played jungle since I started this blog, or even in the last year, it would probably be once. I just don’t get into the trees very much. I had not jungled since the Season Three changes, so this was going to be an interesting experience. All I remember about this game was coming from being down in kills and gold to try to win. 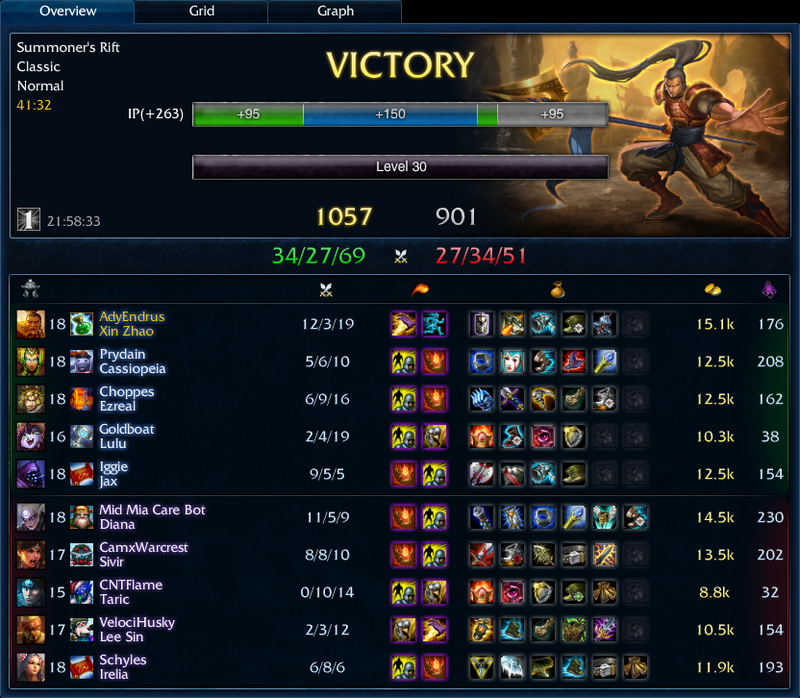 I remember Sivir and Diana doing immense damage and forcing me to get as much health as possible. Xin felt ridiculous. I felt like my damage was way too high based on my items. I felt like my cooldowns were extremely low and that my kill potential was high because of the high base damages of my abilities. After I had Frozen Mallet combined with the slow of my Audacious Charge I could stick on anyone. In team fights I would zone Sivir and Diana until my team could clean up everyone else. In many of those situations, Sivir and Diana would spend more time running away than fighting me, resulting in me just getting free damage onto them. Because of this I finished with most kills, fewest deaths, and most assists. It felt great. The only negative side-effect of this game was that I now ban Xin Zhao in every Ranked game I play because I’m scared to see him emerge from the jungle! It was probably when I got caught by five people on the enemy team and still managed to escape with Ghost that made me so intimidated. That’s the one time that I broke the Demacian Rule: A Demacian Does Not Retreat!